This page explains how to label your BigQuery resources. For information on managing labels, see Managing labels. A label can be added to a BigQuery dataset when it is created by using the command-line tool's bq mk command or by calling the datasets.insert API method. 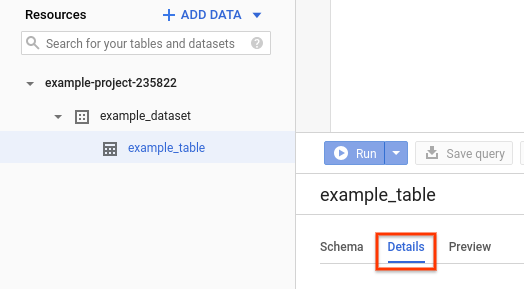 Currently, you cannot add a label to a dataset when it's created via the GCP Console or the classic BigQuery web UI. This page discusses how to add a label to a dataset after it is created. 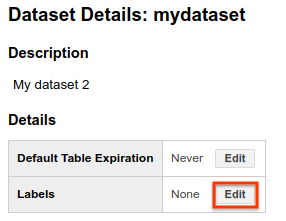 For more information on adding a label when you create a dataset, see Creating a dataset. When you add a label to a dataset, it is included in your storage billing data, but you will not see dataset labels in your job-related billing data. In the BigQuery web UI, select the dataset. Enter your key and value to add a label. To apply additional labels, click Add label. Each key can be used only once per dataset, but you can use the same key in different datasets in the same project. To add a label to an existing dataset, issue the bq update command with the set_label flag. Repeat the flag to add multiple labels. [KEY:VALUE] corresponds to a key:value pair for a label that you want to add. The key must be unique. [DATASET] is the dataset you're labeling. To add a label to an existing dataset, call the datasets.patch method and populate the labels property for the dataset resource. A label can be added to a table or view when it is created by using the command-line tool's bq mk command or by calling the tables.insert API method. This page discusses how to add a label to an existing table or view. For more information on adding a label when you create a table or view, see Creating a table or Creating a view. A label can be added after a table or view is created by using the GCP Console, the classic BigQuery web UI, the command-line tool's bq update command, or by calling the tables.patch API method. Because views are treated like table resources, you use the tables.patch method to modify both views and tables. Note: Table and view labels are not included in billing data. 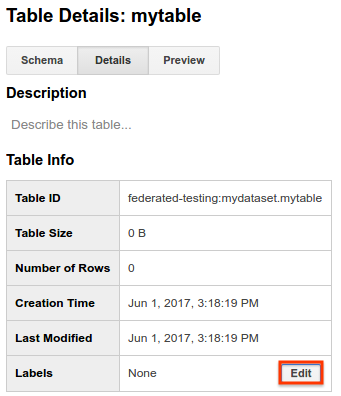 In the BigQuery web UI, select the table, or view. Click the pencil icon to the right of Labels. Modify existing keys or values to update a label. Option 1: Edit the labels manually 1. In the BigQuery web UI, select the table, or view. Enter your key and value to add a label. To apply additional labels, click Add Label. Each key can be used only once per table or view, but you can use the same key in tables or views in different datasets. To add a label to an existing table or view, issue the bq update command with the set_label flag. Repeat the flag to add multiple labels. [DATASET] is the dataset that contains the table or view you're labeling. [TABLE_OR_VIEW] is the name of the table or view you're labeling. To add a label to an existing table or view, call the tables.patch method and populate the labels property for the table resource. Labels can be added to query jobs via the command line by using the command-line tool's --label flag. The command-line tool supports adding labels only to query jobs. You can also add a label to a job when it's submitted via the API by specifying the labels property in the job resource when you call the jobs.insert method. The API can be used to add labels to any job type. You cannot add labels to or update labels on pending, running, or completed jobs. When you add a label to a job, the label is included in your billing data. No special permissions are required for adding a label to a job. If you have jobs.create permissions, you can add a label to your job when you submit it. To run a job, you must have bigquery.jobs.create permissions. bigquery.jobs.create permissions are required for jobs that are automatically created by BigQuery, and they are required for jobs that you run programmatically. Adding labels to jobs is not supported by the console BigQuery web UI. Adding labels to jobs is not supported by the classic BigQuery web UI. To add a label to a query job, issue the bq query command with the --label flag. Repeat the flag to add multiple labels. The --nouse_legacy_sql flag indicates that your query is in standard SQL syntax. [KEY:VALUE] corresponds to a key:value pair for a label that you want to add to the query job. The key must be unique. To add multiple labels to a query job, repeat the --label flag and specify a unique key for each label. To add a label to a job, call the jobs.insert method and populate the labels property for the job resource. You can use the API to add labels to any job type. Enter a new key and leave the value blank. To apply additional tags, click Add label and repeat. Enter a new key and leave the value blank. To apply additional tags, click Add Label. To add a tag to an existing resource, use the bq update command with the set_label flag. Specify the key, followed by a colon, but leave the value unspecified. [KEY] is the label key that you want to use as a tag. Enter the following command to create a test_data tag for mydataset.mytable. mydataset is in your default project. Call the datasets.patch method or the tables.patch method and add labels with the value set to the empty string ("") in the dataset resource or the table resource. You can turn existing labels into tags by replacing their values with the empty string. You can view labels by using the BigQuery web UI, the command-line tool's bq show command, or by calling the datasets.get or tables.get API methods. Because views are treated like table resources, you use the tables.get method to get label information for both views and tables. The permissions required for viewing labels depends on the type of resource you access. To get information about a dataset, you must be assigned the dataset-level READER role, or you must be assigned a project-level IAM role that includes bigquery.datasets.get permissions. All predefined, project-level IAM roles include bigquery.datasets.get permissions except for bigquery.jobUser. In addition, a user assigned the bigquery.user role has bigquery.datasets.create permissions. This allows a user assigned to the bigquery.user role to get information about any dataset that user creates. When a user assigned to the bigquery.user role creates a dataset, that user is given OWNER access to the dataset. OWNER access to a dataset gives the user full control over it. To get information about tables, you must be assigned the READER role on the dataset, or you must be assigned a predefined, project-level IAM role that includes bigquery.tables.get permissions. If you are granted bigquery.tables.get permissions at the project level, you can get information about all tables in the project. All predefined, project-level IAM roles include bigquery.tables.get permissions except for bigquery.user and bigquery.jobUser. In addition, a user assigned the bigquery.user role has bigquery.datasets.create permissions. This allows a user assigned to the bigquery.user role to get information about tables and views in any dataset that user creates. When a user assigned to the bigquery.user role creates a dataset, that user is given OWNER access to the dataset. OWNER access to a dataset gives the user full control over it and all the tables and views in it. In the BigQuery web UI, select the appropriate resource (a dataset, table, or view). For datasets, the dataset details page is automatically opened. For tables and views, click Details to open the details page. Label information appears in the information table for the resource. Use the bq show command with the resource ID. The --format flag can be used to control the output. If the resource is in a project other than your default project, add the project ID in the following format: [PROJECT_ID]:[DATASET]. For readability, the output is controlled by setting the --format flag to pretty. Where [RESOURCE_ID] is a valid dataset, table, or view name. Enter the following command to display labels for mydataset in your default project. Enter the following command to display labels for mydataset.mytable. mydataset is in myotherproject, not your default project. Call the datasets.get method or the tables.get method. The response includes all labels associated with that resource. Alternatively, you can use datasets.list to view the labels for multiple datasets or tables.list to view the labels for multiple tables and views. Because views are treated like table resources, you use the tables.get and tables.list methods to view label information for both views and tables. After the query job is submitted, the job labels do not appear in the BigQuery web UI. To see the labels on a job, issue the bq show -j [JOB_ID] command. You cannot view job labels by using the console BigQuery web UI. You cannot view job labels by using the classic BigQuery web UI. Call the jobs.get method. The response includes all labels associated with that resource. field is expressed as labels. [KEY] where [KEY] is a label key. value is an optional label value. Currently, you cannot list tables or views based on a filter specification. Only the AND logical operator is supported. Space-separated comparisons are treated as having implicit AND operators. The only field currently eligible for filtering is "labels.key" where "key" is the name of a label. The filter can include up to ten expressions. You cannot filter tables and views using a filter specification. Currently, you cannot filter datasets using the BigQuery web UI. Currently, you cannot filter datasets using the console BigQuery web UI. Currently, you cannot filter datasets using the classic BigQuery web UI. Issue the bq ls command with the --filter flag. If you are listing datasets in a project other than your default project, specify the --project_id flag. [FILTER_SPECIFICATION] is a valid filter specification. The command-line tool returns a list of datasets that meet the filter requirements. Enter the following command to list datasets in your default project that have a department:shipping label and a test_data tag. bq ls --filter "labels.department:shipping labels.test_data"
Call the datasets.list API method and provide the filter specification using the filter property. Learn how to Manage labels on BigQuery resources.